In 2006, the Board of Directors of Hemet Concert Association established a Music Education Fund funded by single ticket sales, artist’s CD sales, and donations. This scholarship is seen as one way to achieve our goal of reaching out to young people. The first scholarships were awarded in April of 2007 to San Jacinto Valley high school graduating seniors who are enrolled in an accredited two or four year institution as music majors. Currently, this is a merit performance grant program, although we hope to address the financial need issue in the future. We are also considering expansion of the program to include students at MSJC, and supporting private music student’s tuition. Send email to musicgrant@hemetconcerts.org for more information about the Music Education Fund. Musica! students rehearse for an April 2017 performance at HCCA’s Annual Patron’s Dinner at The Village Retirement Community. 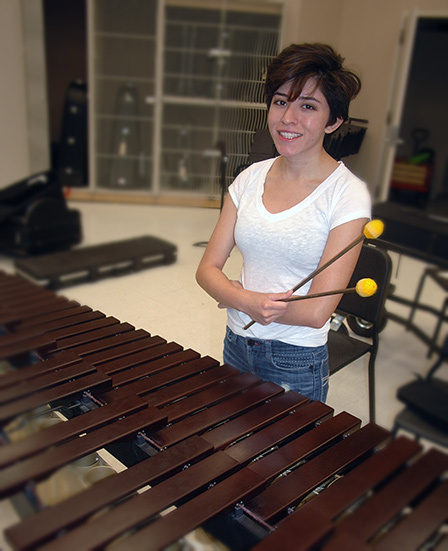 2016 Music Education Fund award was granted to percussionist Anahi del Rio, a graduate of Tahquitz High School in Hemet. She started in August as a music major at Cal State Northridge, and she recently wrote: “I am very happy to be at CSUN and the music department is even greater than I had anticipated. 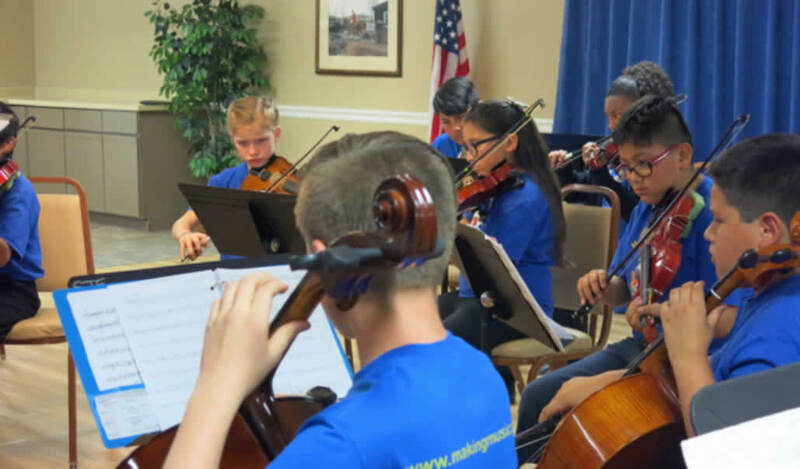 I feel an overall sense of belonging and support within the musical community there.” She added that she is most appreciative of HCCA’s $1,000 financial support. Ramakrishnan Kumaran, flautist, has earned countless awards and travels all over Southern California to perform with orchestras, including Claremont Young Musicians Orchestra and Pacific Symphony Youth Orchestra. He was featured on the NPR program From the Top, which presents the best young musicians from across the United States. He will attend Vanderbilt University in Tennessee. Erec Von Seggern was selected to receive a Music Performance Grant in the amount of $2000.00. He graduated from Hemet High School where he played the flute and the piccolo in the marching band and the pit band. He also plays principal flute and piccolo in the Redlands Youth Symphony and has attended the Idyllwild Arts Summer Wind Ensemble program for the past two summers and plans to attend again this summer. Erec performed in recitals and competitions at several Southern California locations including a Rotary competition where he won a $1000.00 prize. Erec is an outstanding student academically. He plans to attend Lawrence University in Appleton, Wisconsin. Jasmin White, operatic soprano and double bass, West Valley graduate, is attending the Thornton School of Music at USC in Los Angeles on a full scholarship. She is double majoring in classical vocal music and jazz double bass. Jasmin was selected for the role of Dido in Dido et Aeneas by Purcell this Spring semester. Her teacher is now Elizabeth Hynes. She was very active in vocal and instrumental music at West Valley High School and studied voice privately with Jane Atherstone. Ellen Den Herder, flautist, Hemet High graduate, is attending the Mike Curb School of Communications at CSU Northridge. She is majoring in Music Production, and is participating in their General Education Honors Program. Heather Buchmiller, vocalist, is attending the American Musical and Dramatic Academy in Los Angeles with an ultimate goal of a career in Musical Theater. She was very active in music and theater at West Valley High School where she performed the lead in their production of The King and I.
Talia Alofaituli, vocalist, Talia is attending CSU Fullerton majoring in Musical Theater with a minor in Drama. She was very active in Musical Theater at Hemet High School. Barry Lawrence, composer, impressed the Scholarship Committee with his self-assurance, fiery drive, 4.5 GPA, and glowing recommendations. He is currently attending the University of Redlands as a music major, graduating in spring of 2013, with an eventual goal to acquire a Ph.D. in Composition, and, as he put it, “make a living musically”. And the artists who allowed us to keep 15% of their CD sales proceeds for this fund. We can’t do it without you. To donate to the Music Education Fund, contact Mary Ann Hogan, 951-219-0313, or mary.hogan35@yahoo.com. Subscribe today and get tickets to five concerts for $60. That's less than going to the movies!